Fake hyperdontia photo? Real hyperdontia picture? Fake hyperdontia picture on your social media feed and you want to know which are real and which are fake? Is it real or is it a fake hyperdontia picture? Actually, all but one are real. So yes and no, this is a fake hyperdontia photo. The one with the entire upper jaw filled with teeth is photoshopped. If you look closely you will see some of the teeth are simply repeated many times. The child with braces (although looks strange) appears to me to be a child that didn’t lose the front four baby teeth (not true hyperdontia). I believe most of the xrays are people with cleidocranial dysplasia or Gardner’s syndrome. The children with extra sets of jaws I believe have some sort of cleft issue and maybe pituitary gland (DPG)-plus syndrome (almost like a twin that only formed in one part of the body). Technically, I don’t consider that to be a case of hyperdontia, although I could certainly be wrong??? I think the fang picture is someone with 2 mesiodens type teeth (the most common supernumerary). Individuals with supernumerary teeth (hyperdontia) are rare but most dentists will have seen many in a career. The studies indicate from .1%-3.8% of the population have supernumerary teeth (based on a Caucasian population). The most common supernumerary teeth, listed in order of frequency, are the mesiodens, maxillary fourth molars, maxillary paramolars, mandibular premolars, maxillary lateral incisors, mandibular fourth molars, and maxillary premolars. Any dentist will have xrays showing supernumerary teeth and an orthodontist, oral surgeon, or pediatric dentist will have plenty of examples of individuals with all kinds of extra teeth. But these would be examples of either a single of a few extra teeth. The more severe cases as shown above are another story. Lastly, in more severe cases the patient usually has some sort of genetic condition. 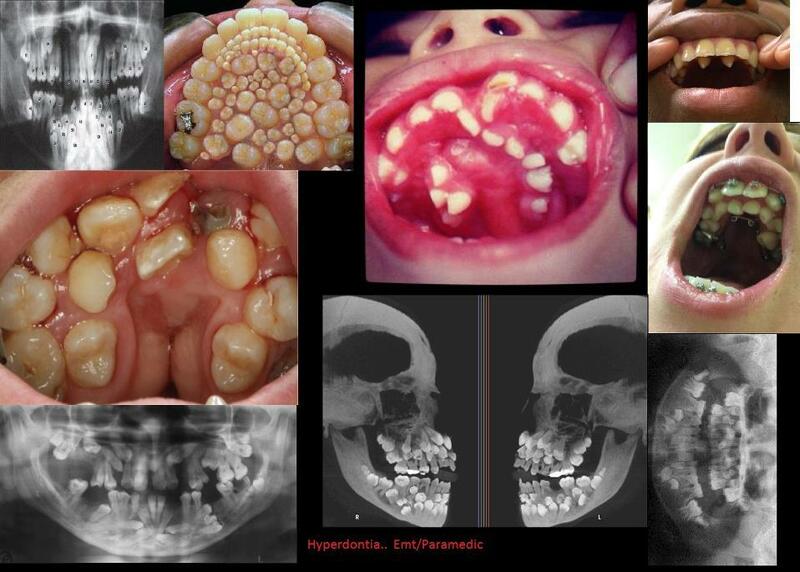 Conditions associated with hyperdontia include cleft lip and palate, Ellis-van Creveld syndrome, incontinentia pigmenti, Tricho-rhino-phalangeal syndrome, cleidocranial dysplasia, Gardner’s syndrome, Crouzon’s disease, Fabry-Anderson syndrome, Hallermann-Streiff syndrome, facial fissures (Oral-facial-digital (OFD) syndrome type I), and certainly other less known genetic conditions. How do we treat hyperdontia? That depends on the severity of the condition. For simple cases of one or just a few supernumerary teeth, like the mesiodens, we simply extract the extra tooth or teeth. Nearly all cases of hyperdontia create bite issues, therefore typically we involve an orthodontist. The syndromes would require a team at a university setting and some type of implant supported prosthesis.